These PLCs have been very famous in Asia. You will be surprised after knowing that several applications are located in the most hostile environments: From sea platforms, goal minery and cement factories. Size, features and excellent price are turning these PLCs as a very good alternative to replace those bulky and expensive PLCs you currently use. re-consider your ideas about using expensive PLCs? The H-series PLCs are a family of small, low cost, pure relay-ladder logic (i.e. No BASIC) based PLCs that are available since 1993. The family spans from the T22H with 12 inputs, 10 outputs to the T64H with 40 inputs and 24 outputs. Members of the H-series controller family differ mainly in the number of I/Os (inputs/outputs), and the type of I/Os they carry (relay or transistor outputs, PNP or NPN types, opto-isolator inputs or high voltage inputs, etc). Since each different PLC model has different wiring requirements, please refer to their respective Installation Guide on the wiring methods and installation details. The number of I/Os, timers, counters, internal relays as well as the maximum allowable program steps are also stated in the Installation Guide. 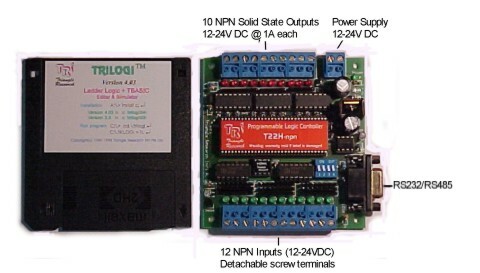 All H-series PLCs are original programmable by means of only the DOS version of TRILOGI software. However, in response to popular customers' request, in Q4/2003 we introduced the Windows version of the TRiLOGI software - WinTRiLOGI version 3.5, specifically for programming the H-series and E10+ PLCs. The mighty little T22H programmable logic controller packs 22 high current, high voltage I/O, 20 timers and 20 counters into a small pocket-size board (See photo, it is about the same size as a 3.5" floppy disk). T22H-npn PLC features high quality, detachable screw-terminal blocks for ease of field wiring and ease of maintenance. The 12-24V DC input interface and high current (1.0A per point) outputs permit T22H to drive solenoids, contactors or small motors directly. 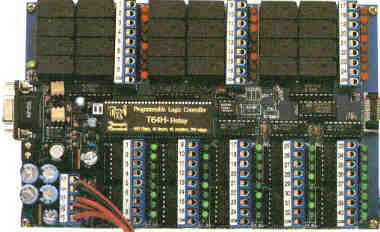 A basic T22H controller comprises 12 inputs, 10 solid-state transistor outputs, 128 internal relays, 20 timers, 20 counters and 8 sequencers. It has a built-in RS232/RS485 port which communicates with the PC using a simple DB9 cable. Designed specifically for power control purposes, the T28H-Relay is the only programmable logic controller that offers 12 high current (10A @ 250V AC), individually isolated relay outputs. The 2500VA contact rating for every output makes T28H-Relay the only true power controller in the industry. Each T28H-Relay controller comprises 16 inputs, 12 outputs, 128 internal relays, 20 timers, 20 counters and 8 sequencers. In addition to basic high-speed AND/OR/OUT instructions, T28H supports a number of useful special functions such as sequencers, reversible up/down counters, differentiated instructions and latch relays to handle the most demanding applications. The palm size T44H programmable logic controller is a general purpose PLC that can fit into the tightest possible space. 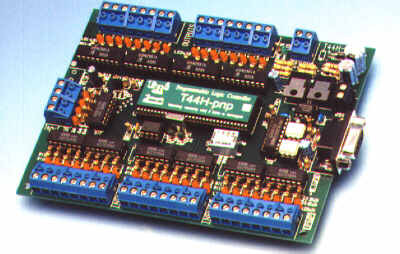 With both the RS485 network interface and opto-isolated RS232C interface as standard built-in features, the T44H controller is ideal for control applications of simple standalone machine, or act as slave I/O board to a large process control networks connecting more than 1300 I/Os to a host computer. Complete point-to-point and multi-drop host-link communication protocols are built-in to every T44H CPU. Hence host computer connectivity and networkability for T44H do not cost you a penny more!! Designed specifically for power control purposes, the T40H-Relay offers 16 high current (10A @ 250V AC), isolated relay outputs with 8 common terminals (every two output shares one common). The 2500VA contact rating for every output makes T40H-Relay and its sibling - T28H-Relay the only true power controllers in the industry. Although H-Series PLC may look like an ordinary single-board computer, they are all programmable using the "Relay-Ladder Logic" language which is the most popular programming language used by all major manufacturer of PLCs such as Allan-Bradley, Siemens AG and OMRON, etc. 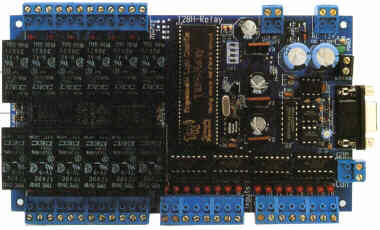 Although programs written in Relay Ladder Logic cannot directly manipulate the microcontroller's internal hardware as easily as the assembly language, such programs are however much easier to write and are generally understood by all electricians around the world who need not have any knowledge about microcontrollers at all. TRiLOGI can monitor the status of all the I/Os, Timers and Counters of the PLC via its RS232C port. It also permits you to pause the PLC and remotely forced-set or reset any I/Os or even modify the current value of the internal Timers and Counters. The I/O status can either be monitored on a full screen display similar to the Simulator-screen, or directly on the ladder diagram. This feature helps greatly during debugging and fine-tuning of your ladder program. In TRiLOGI all the I/Os must be defined with unique label names prior to using them to construct the ladder program. Up to 8 characters of alpha-numeric names can be defined which means you can create ladder diagram using far more meaningful names such as "Start" and "Fire" instead of 001, 205 etc. Once defined, the I/O names will be used throughout the entire session of program creation, simulation and monitoring. Any experienced programmer would be know that a program with meaningful names is far easier to create, debug and maintain than one made up of numbers only. Coupled with the powerful Simulator, you have to try it to believe how easy it is to develop your control program using TRiLOGI ! TRiLOGI allows you to set password protection on the target PLC to prevent unauthorized uploading of your ladder program. "I use TRiLOGI in the college classroom. I have each student download and install TRiLOGI on their home computer, and I then give them programming assignments to do at home. They individually write, run and debug their PLC programs, and then email their program files to me for testing and grading. Since TRiLOGI will simulate PLC operation off-line, each student is able to obtain hands-on programming and debugging experience without having to wait for their turn on an expensive laboratory PLC. The students enjoy using TRiLOGI because they can see their programs run at home without loading them into an actual PLC, it is easy to learn, and the cost for the off-line version is zero." For any additional information please CONTACT US let us know what you need!